...that Shin Malphur continues to hunt the Shadows of Yor? ...that the House of Devils, House of Kings, and House of Winter banded together to attack the Last City? ...that Graviton Lance fires miniaturized black holes as bullets? ...that while Fallen Dregs can be seen piloting Pikes, no Cabal was ever seen piloting an Interceptor in Destiny until Destiny 2? ...that Mercury and Phobos are the only worlds in Destiny to feature Crucible maps, but no Patrol spaces? "Is it considered treasonous if I’m maybe more afraid of Warlocks than of the Hive?" "Treasonous, no. I think the word you’re looking for is “sane”." 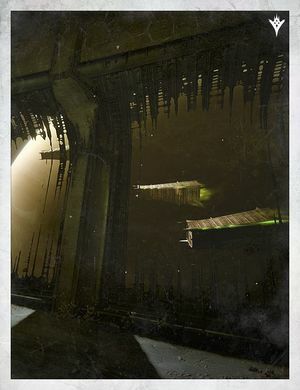 The Dungeons is a Crucible map located aboard a Hive warship orbiting Saturn. "Let us take what we can. You just wait. Pretty soon we’ll be holding matches atop Oryx’s throne." Space-faring Hive vessels contain living components—and like the Hive themselves, are a terrifying amalgam of predator genetics, arcane bio-energetics, and what we must consider as Darkness incarnate. But Lord Shaxx and his Redjacks have proven: even a Hive ship can be tamed. For a complete list, check out our Crucible map directory.